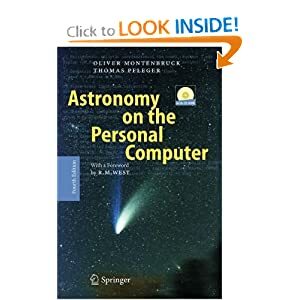 Astronomy on the Personal Computer provides the reader with a thorough introduction to the computation of celestial mechanics, which is of particular significance for carrying out astronomical observations. Covering everything from astronomical and computational theory to the construction of rapid and accurate applications programs, this book supplies the necessary knowledge and software solutions for determining and predicting positions of the Sun, Moon, planets, minor planets and comets, solar eclipses, stellar occultations by the Moon, phases of the Moon and much more. This completely revised edition makes use of the widely implemented programming language C++, and individual applications may be efficiently realized through the use of a powerful module library. The accompanying CD-ROM contains, in addition to the complete, fully documented and commented source codes, the executable programs for Windows 95/98/NT and Linux operating systems.